Japanese researchers at Riken have successfully created cells that will specifically attack cancer cells. These Killer T cells or lymphocytes were developed from induced pluripotent stem cells. Stem cells are cells that can differentiate (transform) into other type of cells, usually a higher form such as tissues and organs. There are specialized stem cells such as heart stem cells or blood stem cells that differentiates into specific type of cells. Stem cells that can differentiate into other type of cells are called pluripotent stem cells. These are usually found in human embryos and what is generally known to the public as stem cells. Scientists have recently discovered a method to convert an adult stem cell (whose differentiation is limited to certain types of tissues/organs) into a pluripotent stem cell. These are called Induced Pluripotent Stem Cell (iPS). iPS cells are special in that it circumvents the controversy on harvesting stem cells from human embryos. White blood cells or leukocytes are cells used by the immune system in attacking foreign and harmful cells. A subgroup of leukocytes are lymphocytes or killer t-cells. Killer T cells are responsible for identifying and attacking infected cells. But when it comes to cancer cells, killer t-cells are not as efficient in weeding out these harmful cells. For one, some cancer cells have a property that prevents if from being attacked by killer t-cells. Another is that, lymphocytes have a short life span that proves ineffective in a prolonged fight. Pathogenic bacteria and viruses are sensed by antigen-presenting cells, such as dendritic cells, and the signal is transmitted to helper T (Th) cells. Th1 cells direct killer T cells to attack virus-infected cells and cancerous cells, while Th2 cells direct B cells to produce antibodies to attack pathogens. Most immune cells differentiate from hematopoietic stem cells in the bone marrow. T cells, however, differentiate in the thymus, where T-cell progenitor cells from the bone marrow differentiate into DP thymocytes, which further differentiate into either helper or killer T cells. 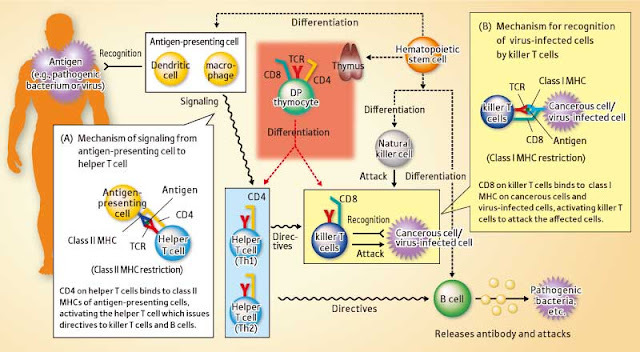 CD4, CD8 and TCR, are expressed on the surfaces of DP thymocytes; CD8 disappears with differentiation into helper T cells and CD4 disappears with differentiation into killer T cells.